Delivery is available for $15 within a 3 miles radius of the bakery with a minimum of $125 order. We reserve the right to arrive up to 15 minutes before or after the scheduled delivery time. For delivery outside the 3 miles radius please call us. Pastry items require a 48 hour notice. 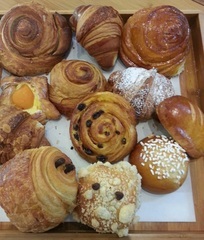 almonds, plain, Rum-raisin or cinnamon, brioches. * Roasted turkey, Tarragon mayonnaise, Swiss cheese, lettuce, tomato, all grain mustard. * Smoked ham, tarragon mayonnaise, Swiss cheese, lettuce, tomato, Dijon mustard. * Salmon, capers, shallots, mayonnaise, lettuce, tomato.